This fresh fruit juice recipe made with grapes, peach, cucumber, and coconut water does not only make a very good refreshment but can also prevent many diseases because of its high nutritive value. 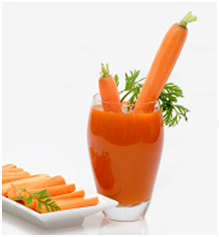 This is healthy vegetable drink made with orange, carrot, and cucumber is nice to have for breakfast or snack. It is packed with fiber, antioxidants, vitamins, and minerals that help strengthen the immune system to fight against infections.